The human aspect plays an important role in the social sciences. The behavior of people has become a vital area of focus in the social sciences as well. 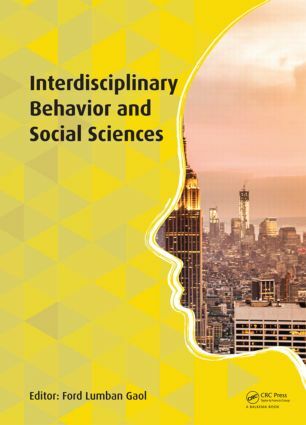 Interdisciplinary Behavior and Social Sciences contains papers that were originally presented at the 3rd International Congress on Interdisciplinary Behavior and Social Science 2014 (ICIBSoS 2014), held 1–2 November 2014 at the Bali Dynasty Resort, Kuta, Bali, Indonesia. The contributions deal with various interdisciplinary research topics, particularly in the fields of social sciences, education, economics and arts. The papers focus especially on such topics as language, cultural studies, economics, behavior studies, political sciences, media and communication, psychology and human development. This printed abstracts volume (92 pp) comes with a full paper CD-ROM (448 pp). Advertising cigarette and alcohol: Is it controversial to you? The representation of Malay proverbs in the mass media: Should they be exploited for humor to generate learning? The importance of positive psychology in education: How does it make a difference? Students’ behavior against internet plagiarism: Ignorance, negligence or intentional?